Home/Law of Attraction, Manifesting/Be Happy NOW! I know that is easier said then done. Are you happy now? Sometimes happy? Never happy? If you want to be HAPPY NOW! Please read. Happiness is a state of mind. If you’re really good at happiness it becomes a state of being. It’s easy with a little practice. How does one become happy? Ah grasshopper! I know that is too easy. Okay, let’s make it hard. Meditate 2 hours a day on your head. Dissect and analyze your past. Attract your soul mate now and never fight. Lose 25 pounds and keep it off. Never get angry or upset. Manifest everything you want, when you want it. Am I making my point? Don’t make it hard to be happy. Okay, let’s make it easy. How? Change your FOCUS. Focus is power. If you focus on what’s wrong, you will find it everywhere and feel it. It will grow like mold on bread! Past, present or future, you’ll find it! If you focus on what’s right, you will find it everywhere! You will feel SO MUCH BETTER! You might even feel HAPPY! It will grow like a puppy. FOCUS on what’s working in your life. FOCUS on how far you have come. FOCUS on your ability to think, focus, feel and attract. FOCUS on someone or something you love. FOCUS on puppies playing with a toy. 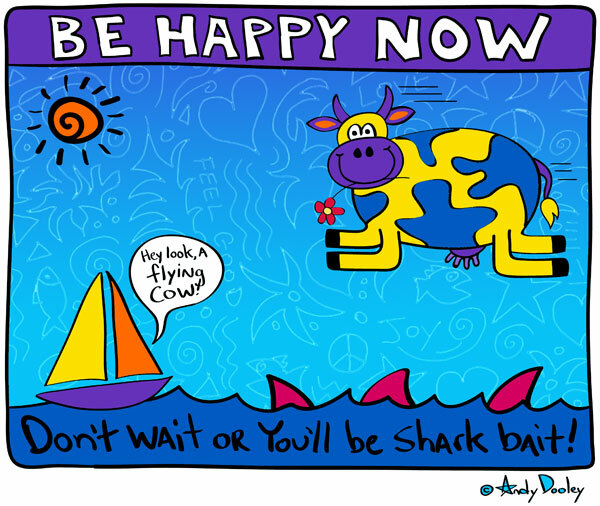 DECIDE 2 BE HAPPY NOW! If all else fails visualize a flying cow! PS – For the next 2 minutes deliberately focus on something or someone that makes you feel good. If you’re really an advanced soul, dance around and celebrate what you already have. This is the way to HAPPINESS without any side effects! PPS – Holy Cow, you did it! I LOVE how simple this stuff really is. Why do we try to make things hard and/or complicated? What a true gift…to allow ourselves to focus on the good stuff. Yep, that’s where the richness is. Thank you for your gift of this “reminder” today–absolutely right-on! How are you!! Thanks for your comment! You rock! Love what you are doing! My friend Bob loves your stuff!!! Keep it flowing! You are right on Target! Buy 1, get 1 free! Great stuff Andy! And I know “being happy” works, too. Just a few minutes ago someone stopped me in the hall here at work to ask me what my “secret” is. They wanted to know why I’m always smiling. I had no idea that I’m always smiling – no one ever mentioned it before. I always make an attempt to be happy, but being notified that I was actually smiling made me smile all the more (especially inside)! You got it Bill! WHat’s on the inside will always manifest on the outside! Thanks Randy I am joining the party!! You are so right. It is so easy. Why do we make it so hard. I’m an artist also, and I try to make this point to my students and followers about art. Art doesn’t have to be hard, confusing, or difficult. Just play and have fun! I posted one of your videos on my blog, and linked over to your site. Thank you for all your inspiration. You make the world a happier place. Hi Andy ! WOW….. what a great way to get this info out. Your a nut bag! and I truely mean that in a great way. You make me laugh. You make me smile. You make me remember to focus.